N.B. All views and opinions expressed in this post are my own. They in no way reflect those of the 2014 New Zealand Post Children’s Book Awards judging committee. It’s now three weeks since I got my first lot of books that were submitted for next year’s New Zealand Post Children’s Book Awards. I’ve been mixing up my reading, switching between junior fiction and young adult fiction. So far, I’ve been really impressed with the quality of the writing and the range of genres represented. Deborah Burnside’s Rebecca and the Queen of Nations transported me back in time, Vince Ford’s Scrap: Tale of a Blond Puppy introduced me to the life of a sheep-dog, I spent a week in a hut with no power in Joy Cowley’s Dunger, and I met a young Odysseus in Catherine Mayo’s Murder at Mykenai. One of my favourites so far has been Bugs by Whiti Hereaka, a Young Adult book about the unfolding lives of three young people in their last year of school in small-town New Zealand. I’m looking forward to meeting with my fellow judges and hearing their opinions of the books that they have read. I’m curious to find out whether we have similar opinions on our top books. Judges Diary: Oh the anticipation! 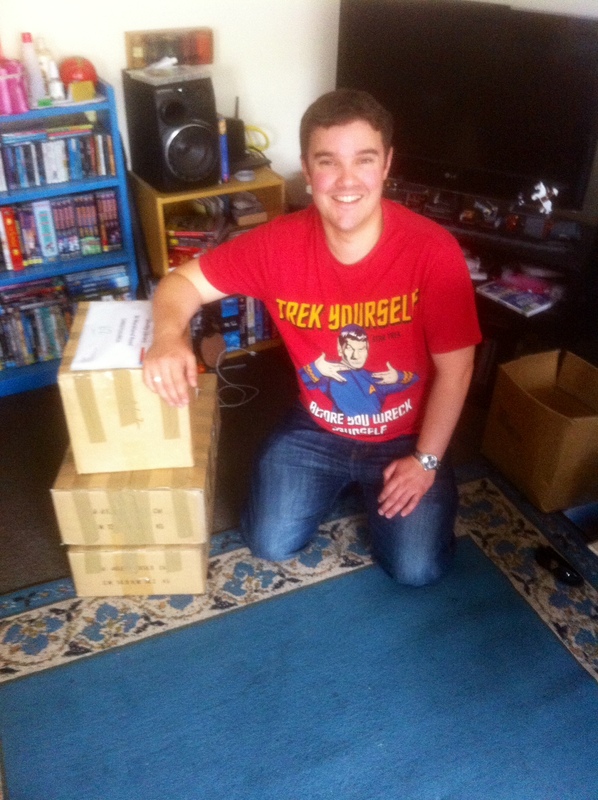 Imagine my surprise when I came back from a couple of days away to find 3 big boxes of books waiting for me. Ever since the announcement that I’m going to be a judge for the 2014 New Zealand Post Children’s Book Awards, I’ve been wondering which books will be chosen to be considered for the awards. There have been so many wonderful New Zealand books published in the last year and I’ve had quite a few favourites. When I couldn’t wait any longer I opened the boxes to find 104 beauties (only the first lot of submissions) waiting for me to open their covers and discover the stories and information that await inside. I was glad to find my favourites, those stories that have stuck in my mind, as well as some I had really wanted to read but hadn’t got around to, and some books that I hadn’t even heard of. There are some whose covers and design jump right out at you and beg to be read, and others whose poor design and production will be barriers for some readers discovering the story within the pages. My mountain of books awaits me so I must get started. I’ll report back soon on how the reading is going and what gems I have discovered. I’m thrilled to finally be able to announce that I’ll be joining Barbara Else and Ant Sang as a judge for the New Zealand Post Children’s Book Awards next year. I’m incredibly honoured to be a part of the awards and it’s very exciting. I’ve been a part of the New Zealand Post Children’s Book Festival for the last 3 years, as the coordinator for the Canterbury Festival. This is a role that I have loved as it has given me the chance to take the finalist books out to my region and share them with children of all ages. The roadshow that our Canterbury committee did this year for the Festival was one of the best experiences I’ve had as a librarian, as we got to talk about the finalist books and read them to so many children in our region. Having the opportunity to actually be one of the three people choosing which books are the best books in New Zealand over the past year feels absolutely incredible. We have so many talented authors and illustrators in New Zealand who create some magical, captivating, adventure-filled and even heart-breaking books, so it is going to be a huge task to choose the best. 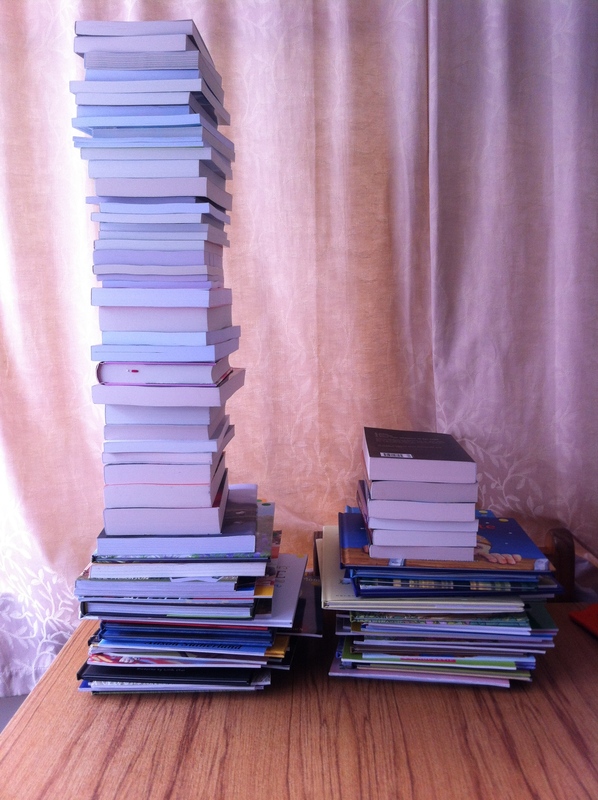 I’m going to have lots of reading ahead of me – approximately 120 books! I’m certainly looking forward to receiving my first box of books and starting my reading. There will be books that I’ve already read and loved, but there are sure to be some treasures that I’m yet to discover. I hope to share some thoughts on my life as a judge here on the blog and talk about some of the books I’m reading. To find out more about the 2014 judges check out the New Zealand Post Children’s Book Awards website. The finalists in the 2013 New Zealand Post Children’s Book Awards gathered in Christchurch last night for the awards ceremony. The awards night is always themed and this year the organisers went for a ‘Witch in the Cherry Tree’ theme in honour of Margaret Mahy. The book of the year was also renamed the ‘New Zealand Post Margaret Mahy Book of the Year’ this year. I was nervous myself, hoping that my favourites would take out the award, so I’m sure the authors and illustrators themselves were incredibly nervous. Overall, I was pleased to see a couple of my favourites win awards, but I was disappointed that others missed out. I think that Red Rocks and The Nature of Ash are amazing books and if I could give Rachael and Mandy an award I would. Read below to find out who won each category, as well as the Honour Book and Children’s Choice Award. Last week I spent the week out on the road with two awesome librarians, Saskia Hill and Susan Dodd, as part of the Canterbury NZ Post Children’s Book Festival Roadshow. We decided that this year, we wanted to talk about and read the finalist books to as many children as we possibly could over the course of the Festival week. We battled heavy rain, flooding, horrible traffic and a flat tyre to deliver our Roadshow to the kids of Canterbury. We visited 11 schools, 13 preschools, presented 2 Books Before Bedtime Pyjama Parties and read to over 6000 children over the course of the week. Part of our programme was performing Margaret Mahy and Gavin Bishop’s wonderful picture book, Mister Whistler. I danced around as Mister Whistler, while Saskia read the book and got the kids interacting with the story. Here’s a couple of photos of my performance. Dressing up as Mister Whistler and dancing around while taking my clothes on and off. Giving away heaps of copies of Kyle Mewburn’s Melu and Rachael King’s Red Rocks to kids all around Canterbury and seeing their faces light up. Seeing kids so eager to answer questions about the finalist books so they can win a bookmark. Meeting lots of enthusiastic teachers and librarians who love books. Reading and talking about books with kids of all ages and doing it all with one of the coolest people around, Saskia Hill. Best of luck to all the authors and illustrators on the shortlist for the awards. I’m really looking forward to going to the awards ceremony here in Christchurch tonight. I’ll be live Tweeting from the event so if you want to know the winners first, follow me – @zackids. Can you guess the NZ Post Children’s Book Awards finalists? The New Zealand Post Children’s Book Festival starts on Monday 17 June (that’s next week) and our committee here in Christchurch can’t wait to bring the Festival to the children of Canterbury. The main part of the Canterbury Festival this year is our Roadshow. We’re taking the finalist books on the road and visiting schools and preschools throughout Canterbury, from Ashburton up to Rangiora. We’ll be reading and talking about the finalists and I’ll be stepping in to Mister Whistler’s shoes each day. We wanted to have a cool way to promote the books to the kids in each of our sessions so we came up with the idea of reading an extract from some of the books. The kids will then have to guess which book the extract comes from. It’s an easy idea that you could use in your classroom or library too. See if you can figure out which 2013 New Zealand Post Children’s Book Awards finalist book these extracts come from. I hope you all have a great festival week, whatever you may be doing. I certainly can’t wait until the awards ceremony in Christchurch on Monday 24 June to find out who takes out the awards! There are heaps of great activity ideas out there to help you celebrate the 2013 New Zealand Post Children’s Book Awards. These ideas are aimed at teachers but you could try them out at home too. There are some general Schools Resources on the Booksellers NZ New Zealand Post Children’s Book Awards pages – http://booksellers.co.nz/awards/new-zealand-post-childrens-book-awards/2013resources. A Great Cake by Tina Matthews – Classroom ideas on the Walker Books Australia website. Mister Whistler by Margaret Mahy, illustrated by Gavin Bishop – Maria Gill’s teacher’s resource for the What Lies Beneath exhibition. Remember That November by Jennifer Beck, illustrated by Lindy Fisher – Maria Gill’s teacher’s resource for the What Lies Beneath exhibition. Mister Bear Branches and the Cloud Conundrum by Terri Rose Baynton – Teacher’s notes on the HarperCollins Australia website. The ACB with Honora Lee by Kate De Goldi – Teacher’s Resource Kit on the Random House NZ website. My Brother’s War by David Hill – Teacher’s Notes on the Penguin Books NZ website. Red Rocks by Rachael King – Teacher’s Resource Kit on the Random House NZ website. The Queen and the Nobody Boy by Barbara Else – Teacher’s Notes on the Random House NZ website. Uncle Trev and the Whistling Bull by Jack Lasenby – Teacher’s Notes on the Random House NZ website. Earth Dragon, Fire Hare by Ken Catran – Social Sciences Unit on the HarperCollins NZ website. The Nature of Ash by Mandy Hager – Teacher’s Resource Kit on the Random House NZ website. Snakes and Ladders by Mary-anne Scott – Teacher’s Notes on the Scholastic NZ website. At the Beach by Gillian Candler and Ned Barraud – Activity ideas on the Craig Potton Publishing website. Taketakerau: The Millenium Tree by Marnie Anstis – Teacher’s Notes on the Taketakerau website. I’ve been a huge fan of David Hill since I was a kid. I remember See Ya Simon being read to me at school in Year 6, laughing out loud one minute then crying the next. One of the things I love about David is that he hasn’t stuck to one type of story. He’s written historical stories, hilarious school stories, thrilling adventure stories, and even some science fiction (Bodies and Soul is one of my favourites). David is a finalist in the 2013 New Zealand Post Children’s Book Awards with his novel, My Brother’s War, which offers a different perspective on the Great War and the New Zealanders who went to fight. My Brother’s War presents a view point of war that hasn’t been dealt with before and it’s a story that all older children should read. It would be a great book to share as a class text in Year 7/8 as it would create a lot of discussion. The ACB with Honora Lee is a finalist in the Junior Fiction category of the 2013 New Zealand Post Children’s Book Awards. I reviewed it in October last year, so if you want to hear all about it and find out what makes it such a worthy finalist, read on. Kate De Goldi’s last book, The 10PM Question, was a wonderful story and won many awards. It’s a story that’s loved by adults and children alike, and Kate’s latest book, The ACB with Honora Lee, is bound to have the same crossover appeal. I first heard about it when Kate talked about it at the Schools Programme for the Christchurch Writer’s Festival and I’ve been dying to read it ever since. I immediately fell in love with Perry and the residents of Santa Lucia. The ACB with Honora Lee is a quirky story about an unusual girl who finds friendship in an unlikely place. The story is brimming with humour, joy, wisdom, and a cast of colourful characters. It’s set in the Beckenham loop in Christchurch (where I live) and I only wish that I could go and meet Perry, Honora Lee, Dorris and the rest of Kate De Goldi’s characters. Perry is a unusual girl, who acts and sounds older than her 9 years. She seems quite lonely when we first meet her. Her parents are wrapped up in their own problems and don’t seem to have time for her. They don’t take much notice of her and enroll her in after school activities that she doesn’t really enjoy. Even when she really enjoys going to visit her gran and the others at the rest home, her parents don’t understand. Perry makes lots of new friends at Santa Lucia, including her gran’s friend, Doris, and Stephen and Audrey who work there. The fact that her gran doesn’t remember her doesn’t seem to worry Perry, she just reminds her who she is each time she visits. The thing that I like the most about Perry is her love of words. If she hears a word she doesn’t understand she has to find out what it means. It’s Kate De Goldi’s whole cast of wonderful characters that make The ACB with Honora Lee such an enjoyable read. Their interactions provide some funny, embarrassing and touching moments. It’s a story that will be enjoyed by the young and the young at heart and it will leave you with a smile on your face.